Making the first cut of our fields for hay this late in the summer provides a benefit of windrows looking very robust. 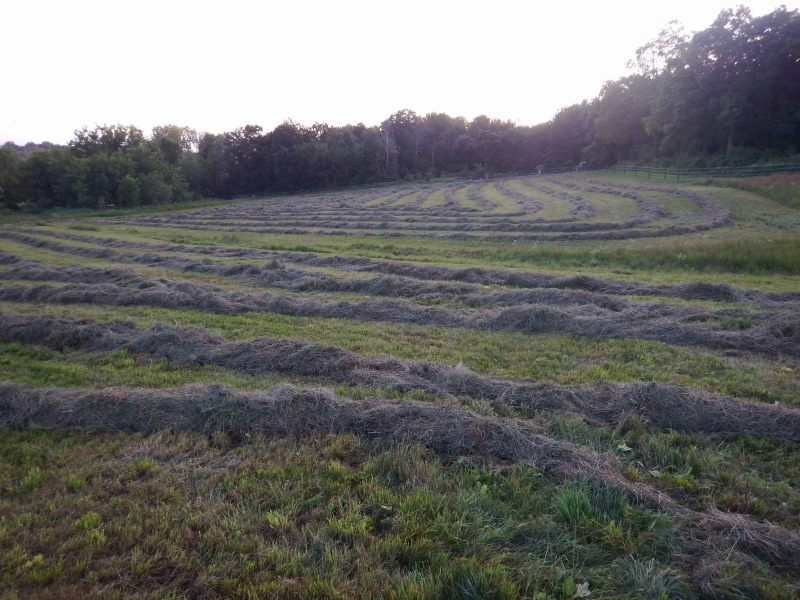 When we got home from the lake on Sunday, both our hay-field and the back pasture were cut. Yesterday, Jody raked the cuttings into rather buxom windrows. The result was a gorgeous scene to behold. This afternoon he will bale. We are going to store a wagon load in our almost filled hay shed and he will take the rest. If we could rely on him being able to cut our fields every year, we could probably get away with not buying any hay from our other sources. 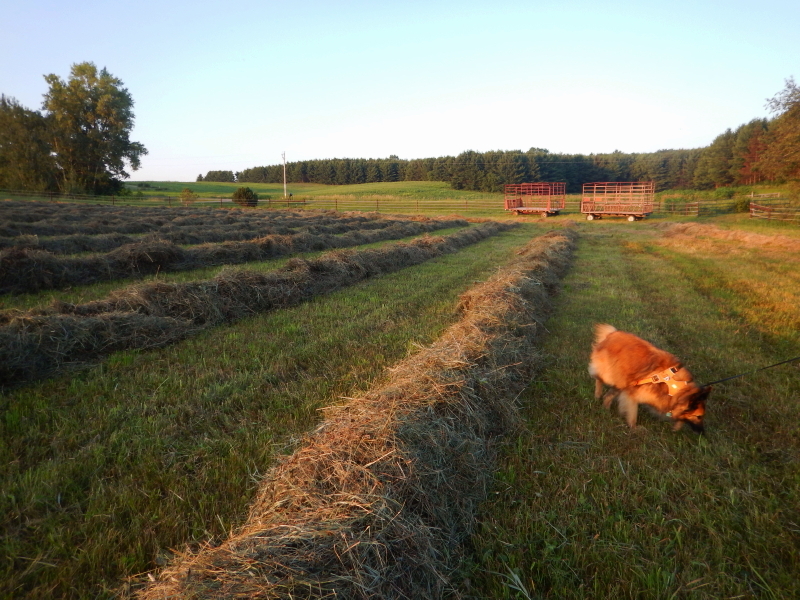 I don’t know if he would be as motivated to help us if he wasn’t getting some bales out of the deal, so it’s not a guaranteed plan, but it’s an enticing dream to ponder. Walking our property last night was an immersion in a quintessential country summer evening. The air was thick with a potpourri of aromas from wild plants and cultivated crops approaching their peak. Songbirds, frogs, and crickets provided a steady humming soundtrack for the hours on both sides of the sunset. With the air calm, there was little else moving to muddy the sound. The temperature was warm and perfectly humid, well short of feeling uncomfortable. It was the kind of day to burn into our deepest memories, hoping to make it available again for the depths of the cruelest days that winters regularly dish out. Locally grown sweet corn is starting to show up and the watermelon is once again flavorful. County fairs are in full swing. With a seeming emphasis, yet an inviting ease, it smells, tastes, and sounds like we are smack dab in the thickest part of summer. Might as well throw some more bales of hay.